Notice that we have also included a configuration section. Apart from anything else, this will get rid of the annoying messages about the low power programming and watchdog (the watchdog is a very useful feature, but that will have to wait for another day). There is an easy way to generate the configuration, which is to select Configuration Bits from the Window / PIC Memory Views menu item. From there you can change the options and the press the Generate Source Code to Output button. The regulator is supposed to output 3.3V, so that’s spot on. This will choose the correct include file (in this case pic12f1840.h). 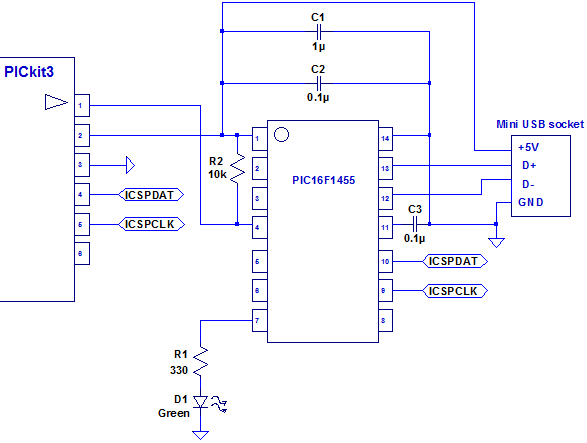 You’ll notice that the delay loop (which I’m still not proud of) has less iterations than the PIC32 chip. This chip is considerably slower! By default the device is running at 500KHz. We can increase this to 32MHz, but the power consumption will be much higher. 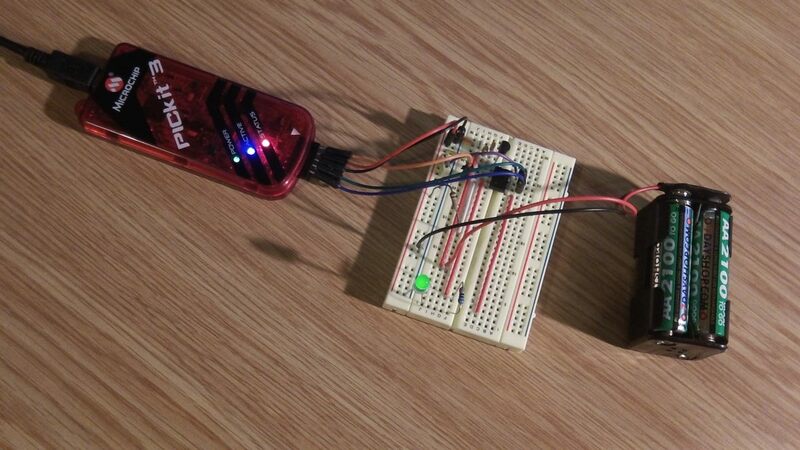 One advantage of powering the device externally is that we can disconnect the programmer and the code will still run. In order to do this we need to select Run Project (Blink2) from the run menu. The code, which is stored flash memory even when the power is off, will then happily just start running as soon as the battery is connected. With the PIC running just off the battery, I thought I’d check the current consumption. The current fluctuates between 0.16mA and 3.34mA depending on whether the LED is off or on. Given that the voltage drop across the LED should be about 1.8V, 3mA is what I would expect to be going through the LED. As you can see though, it doesn’t draw much current when it is running. With proper use of sleep modes it is possible to get this device to use much less current when operating. Last time we saw how to set up the PICkit3 with MPLABX and get a very simple program running. The program didn’t actually do anything though! 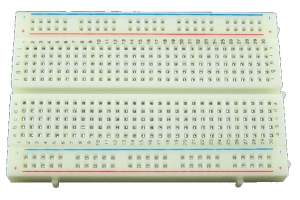 So this time we are going to add an LED to the breadboard and make the LED blink on and off. 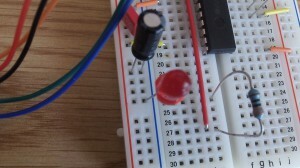 The LED is connected via a 330 ohm resistor from pin 2 (RA0) to GND. Now when we run the project from the Run menu, the LED should blink on and off. The delay loop is bad code. I’m not proud of that, and I wouldn’t suggest using it in your projects! I’ll show you how to do it properly in a future post. 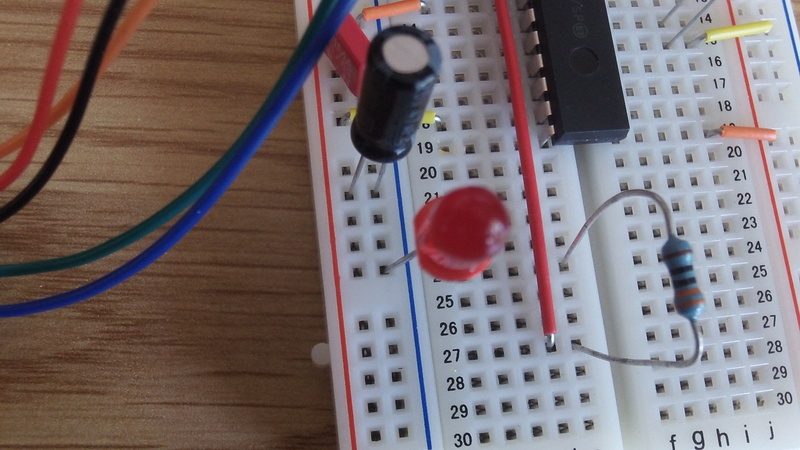 The aim of this post is to describe how to put a PIC32 chip on a breadboard (I’m using a PIC32MX250F128B), connect up the PICkit3 between the board and the PC, and then debug a really simple program (that just flashes an LED). Install MPLABX first, and then install XC32. You then connect this up to the PC with a USB cable, and start the MPLABX IDE. To create our simple project, select New Project from the file menu. Select Microchip Embedded, Standalone Project from the categories / projects windows. Press Next. 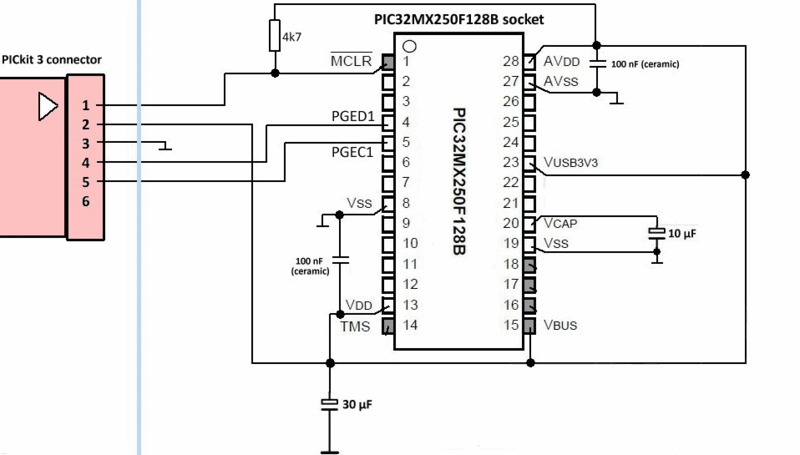 Select the device, in my case 32 bit MCUS / PIC32MX250F128B. Press Next. Select PICkit3 as the tool. Press Next. Select XC32 as the compiler. Press Next. Choose a name for the project. I chose Blink1 Press Finish. In the Projects window, right click on Source Files. and select New, C New Main File… and enter the name “main” (instead of newmain). Press Finish. 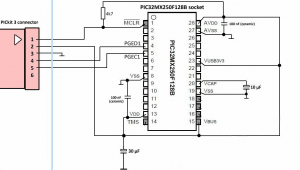 Before we run this on the real device, we need to make sure that the chip will be powered from the PICkit3. To do this you need to select Project Properties (Blink1) from the file menu. In the left hand window (Categories) you need to select PICkit3. On the right you will then see a dropdown labelled Option Categories. From this select Power. 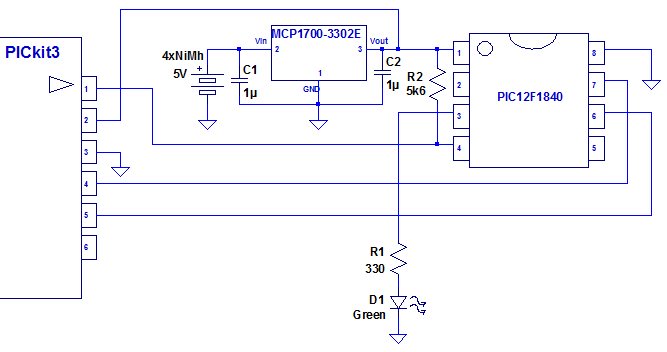 In the options below you will now see Power target circuit from PICkit3. Check the checkbox. Leave the voltage level as 3.25. Press OK.
Not very exciting after all that work! And no evidence that it really is working. Lets add a breakpoint. The PICkit 3 does not support the ability to set breakpoints while the devices is running. The breakpoint will be applied prior to the next time you run the device. When you have stopped at an existing breakpoint. Still not very exciting. But at least we can see that something is happening. It’s probably worth having a quick look at what you do when you are stopped at a breakpoint. On the Window menu there is a Debugging option. From here we can see variables and the disassembly for instance. We can also see the contents of memory and registers on the PIC Memory Views menu item… but detailed explanations would take far too long to go through now. I’ll do that in a later post. Anyway, that’s enough for now. Next time we’ll modify the circuit to add an LED, and make it blink – after all that is the name of the project! 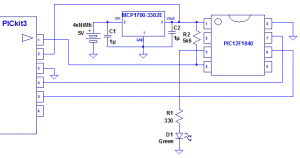 Which micro-controller should you use? Micro-controllers have been around a long time. Just recently though they have attracted a lot more interest, thanks mainly to the Arduino boards. People all over the world are now building all sorts of exotic and innovative creations. If you are new to micro-controllers you would be well advised to start with an Arduino board (Arduino website). Once you have played with this for a while you will probably be interested in getting some of the shields (plug in boards) that help out with tasks like driving motors (e.g. for robots) or LCD displays or connecting via wireless. USB or ethernet etc. You will also discover that there are other boards available – using different processors. The ones that I’m going to mention here are the PIC based ones made by Digilent (chipKIT). These are the Uno32, uC32, DP32 and Max32. They are all based on the PIC32 chips. They run a lot faster than the Arduino boards (which are based on Atmel processors). 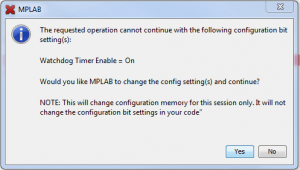 Be warned though that you won’t be able to use the Arduino IDE – you have to use a specially adapted version called MPIDE. 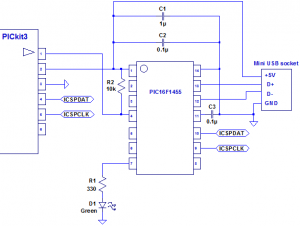 The idea is that you should be able to use sketches built for Arduino boards and recompile them without modification using MPIDE for the chipKIT boards. In practice, it’s not always as easy as that, so if you decide you want the faster speed and extra features, you may have to put up with having less support than you get with the Arduino boards. There is another approach, which I am going to use – which is to use the PIC devices directly. 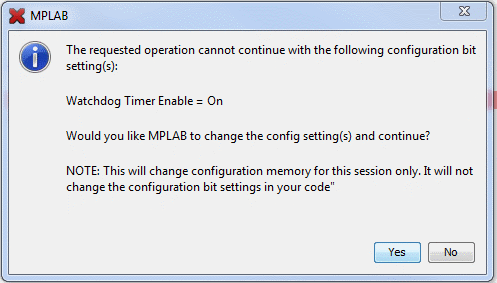 Also, instead of using the MPIDE, I will be using Microchip’s IDE – MPLABX. Microchip provide three free compilers – XC8, XC16 and XC32 depending on whether you are programming an 8bit, 16bit or 32bit chip. They also provide an assember – MPASM if you need really feel the need to write the code directly in assembler! Debugging (including breakpoints and register / variable inspection). Ability to use a much wider range of devices. Easier to understand hardware (most projects can be done with very few external components). There are many other benefits – this is just some of them. So if you’ve got here, you’re either an advanced user, or you’re felling brave and want to do some real hacking with real devices. If it’s the latter I applaud your ambition! I will try to make this as painless as possible with the upcoming tutorials. I am sure that you will find it much more satisfying than using a pre-built board. Welcome to my PIC tutorials. 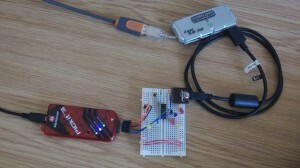 Over the coming weeks and months I plan to show some exciting ways to use the PIC micro-controllers. I’ll be working with devices from the PIC10 all the way up to the PIC32. Most of these devices are very inexpensive, but they really can do a LOT. I’ll start by looking at what’s available, and then I’ll dive into programming some simple examples. 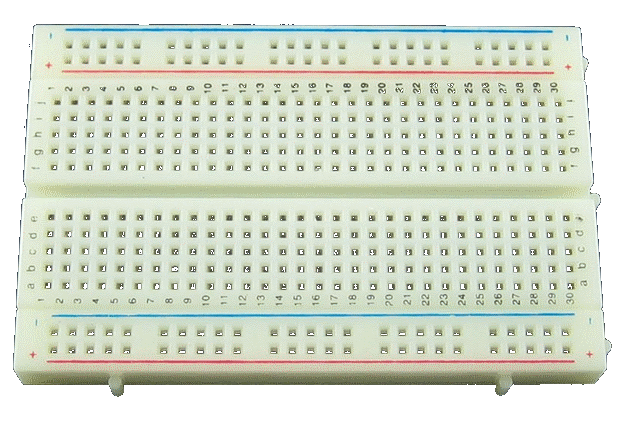 I’ll also occasionally include some articles about Arduino and chipKIT boards.